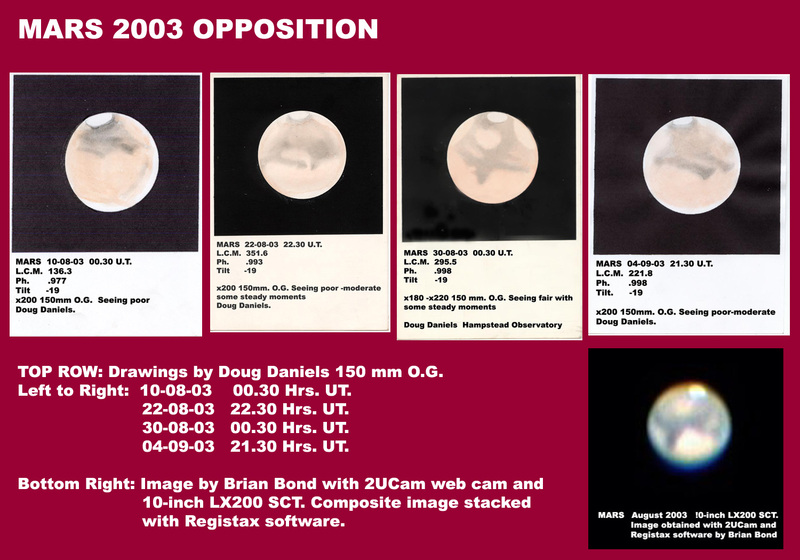 During August 2003, Mars was in close opposition and on August 28th, the planet made its closest approach to the earth for 60,000 years! At just .37 AU (34.4 million miles), from earth, Mars attained a visual magnitude of -2.9 and presented a disk diameter of some 25 arc/secs - just about as large as it can get and considerable detail could be discerned despite the low declination of the planet for northern hemisphere observers. This year, National Astronomy Week was arranged to coincide with the opposition of Mars and the Society opened the Observatory on every clear night during the week. In all, over 400 members of the public took the opportunity to observe the planet. Despite the low declination of the planet, convection currents rising from a city gripped in a mini heat wave, a turbulent atmosphere and the vapour trails of numerous aircraft, the prominent wedge shaped feature Syrtis Major was easily seen. The white southern polar cap was very obvious as Mars� southern hemisphere was tilted towards us by about 19 degrees. On all the open nights some visitors lingered to well after midnight by which time the planet had risen to its maximum height above the horizon and the definition improved. The view in the early hours of the 31st. can only be described as �stunning�. By this time the Syrtis Major had just crossed the central meridian and further south a dark Iapigia contrasted with the pale ovoid of Hellas which was well seen bordered by the Mare Hadriacum and Trinacria to the east and Yaonis Regio and the Mare Serpentis to the west. Syrtis was followed by a dark Sinus Sabeus, above which the pale Deucalionis Regio stood out in contrast to the dusky streak of Pandorae Fretum to the south. Further to the south and west, Noachis paled into the planet�s western limb. The northern tip of Syrtis was quite dark and to the east Moeris Lacus could be discerned below a pale Libya, above and to the east of which stretched the dark swathe of Mare Tyrrhenum, but I could not trace Nepenthes. The southern polar cap was quite prominent with a dark collar, particularly dark on the eastern border of Depressio Hellispontica. The desert regions of Aeria and Arabia appeared quite featureless with no trace of either Phison or Euphrates. The brighter desert regions Meroe, Dioscuria and Cydonia, merged into a general limb brightening to the north. I saw no trace of Ismenius Lacus. Observations continued to well past opposition but the rapidly shrinking disk size coupled with the low declination made observations increasingly difficult from London. We look forward to the next opposition in two years time when despite the planet�s greater distance, its higher declination will perhaps afford us a better view.